Greetings friends and bloggers. Today's creation is an Altered Laughing Cow Cheese Box. My family eats this cheese so I have quite an assortment of boxes at my disposal! This box when it is altered is just so beautiful. You can't go wrong with this as a gift presentation. Put a gift card in here and you have yourself a WOW gift. 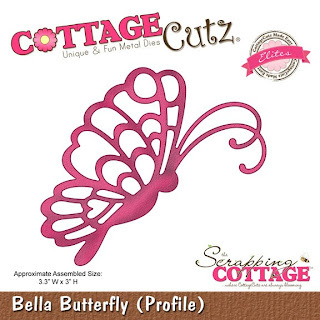 To begin, cut two of the CottageCutz Bella Butterfly (Profile). To get this old vintage rose color, I used a light gray cardstock and distress inked it with Victorian Velvet distress ink. Isn't it cool! Then paint the two butterfly pieces with glitter glue and sprinkle with plain white Martha Stewart glitter. Let dry and put the two pieces together with pop dots. You can shape the wings once it's dry to look like this. The Laughing Cow Cheese box was painted with two coats of white acrylic paint. None of the labels were removed. The paint covers those labels nicely so you do not see them. 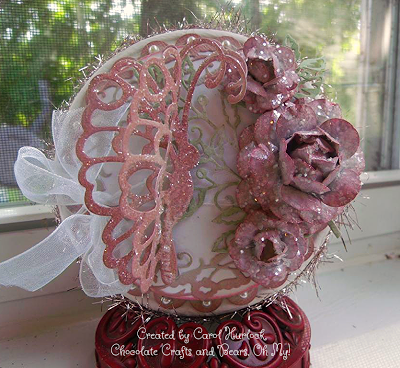 For the roses, I used a medium flower punch for the small roses and a "Whale of a Punch" flower for the large rose. I punched them out on the light gray cardstock and distressed with Victorian Velvet distress ink. They were painted with crystal effects and sprinkled with Martha Stewart Coarse Glitter. 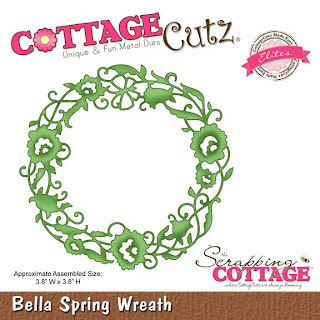 The Bella Springtime Wreath was cut from the gray cardstock as well and distressed on the outer edges then attached to the largest Spellbinders Nested Circle die cut. This was attached to the largest Spellbinders Nested Scallop Circle die cut and attached to the top of the box. 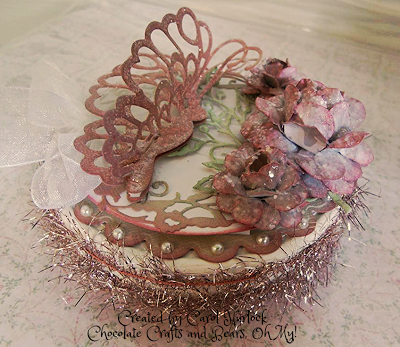 To decorate around the outer edge use tinsel trim which can be purchased at Michael's. 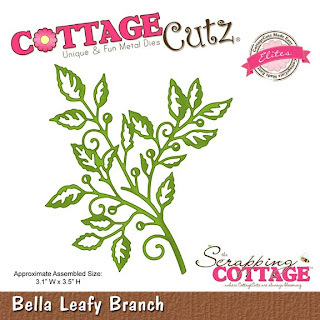 The Roses have been mounted on top of the Bella Leafy Branch. Pearls were added to the scallops around the die cut. Beautiful, Carol. I love how you achieved the vintage rose color. I have some Laughing Cow cheese boxes in my refrigerator right now. Need to recycle when they are empty. The tinsel is wonderful, too. Have a great weekend. Hope you're not suffering with the heat. Gorgeous flowers and butterfly! Just love the added touch of sparkle too :) Fabulous creations! 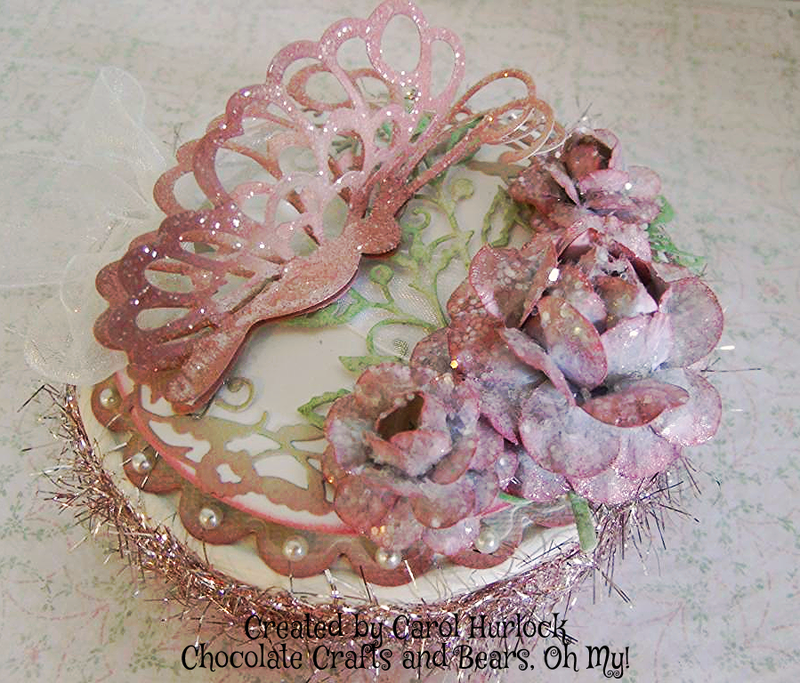 what a gorgeous butterfly and card Carol, stunning dies too. Just beautiful! Love the roses! A WOW gift indeed! You are definitely the Queen of altered boxes! I don't believe anyone does them as beautifully as you do! Not sure how I missed this post! Lovely idea starting with grey cardstock and building from there! Let's make a flower like this in Jack. ok? 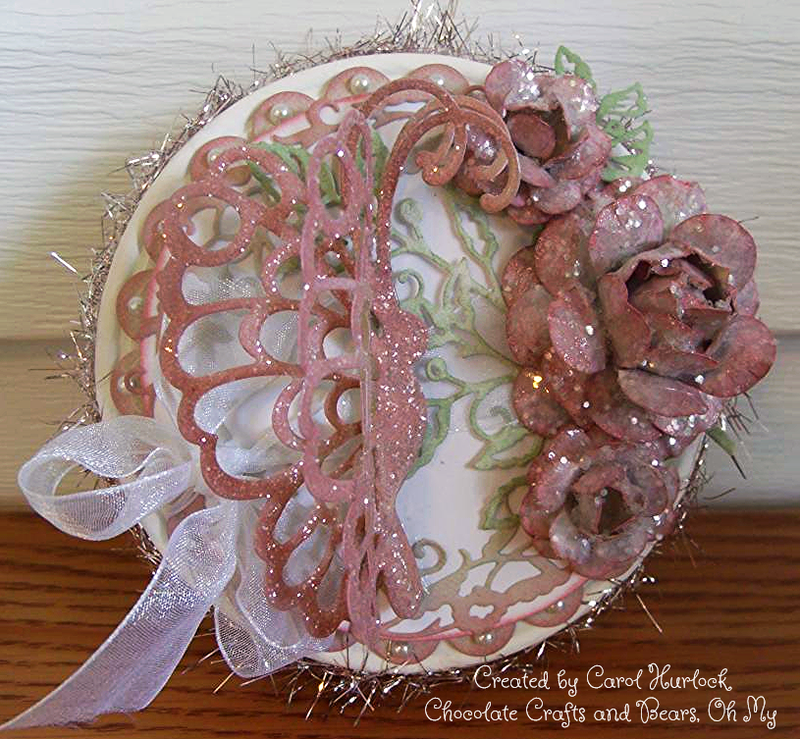 I like the idea of paining the petals with Crystal Effects - I need to try that too. You are so smart - I have a few of the cheese boxes left from the project I cased you on before - I may just try this over the weekend. Lovely creation my sweet friend. Hugz - lots of them! Oh, I love when you do up the cheese boxes! :) they are always gorgeous. Such pretty die cuts you used on here! OH My! This is stunning!!! I will never look at my laughing cow cheese boxes the same... because they will now be kept to alter!! The flowers you made are absolutely over-the-moon gorgeous!!! I was surprised to read they are punches. You know how to work your magic on them! And the die cuts are super elegant...love that layered butterfly!